John Michael “Ozzy” Osbourne (born 3 December 1948) is an English singer-songwriter, whose career has now spanned four decades. Osbourne rose to prominence as lead vocalist of pioneering English heavy metal band Black Sabbath, and eventually achieved a multi-platinum solo career which revolutionized the heavy metal genre. Nightwish is a Finnish symphonic power metal band, formed in 1996 in Kitee, Finland. The band has sold more than 5 million CDs, DVDs and online material internationally. My Dying Bride is a British doom metal band formed in 1990. My Dying Bride is one of the three bands responsible for the formation of death/doom metal, along with Anathema and Paradise Lost. Metallica is an American heavy metal band that formed in 1981 in Los Angeles. Founded when drummer Lars Ulrich posted an advertisement in a local newspaper, Metallica’s line-up has primarily consisted of Ulrich, rhythm guitarist and vocalist James Hetfield, and lead guitarist Kirk Hammett, while going through a number of bassists. 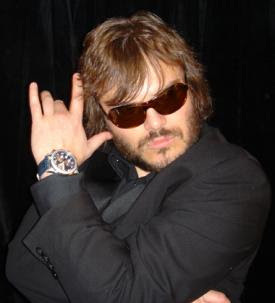 Thomas John “Jack” Black (born August 28, 1969) is an American actor, comedian, & musician. With his friend Kyle Gass, he makes up one half of the comedy and heavy metal music duo Tenacious D.